Tuesday but feels like a Monday, am I right?! We had such a great weekend with our friends from Kentucky and are seriously dragging this morning. But both kiddos are off to school and this mama is about to go ham on this messy house and packing for NYFW. Swoon. Seriously, Fashion Week has to be one of my favorite weeks of the year. I love to see the new designs, be surrounded by others in the fashion industry, and stroll the streets of New York City. Part of me wishes I would have lived there for a short period of time but can’t change the past, can we? At least I can go twice a year and live out my Carrie Bradshaw dreams. It has been so chilly the past few days (minus the random 85 degree day yesterday) and I’ve been LOVING it. Seriously, there’s nothing better than fall in the midwest. Gladly accepting visitors because you don’t want to miss it. So many fall festivals, farm visits, changing leaves, ugh it’s amaze. I got this sweater during the Nordstrom Anniversary sale and it screams fall. 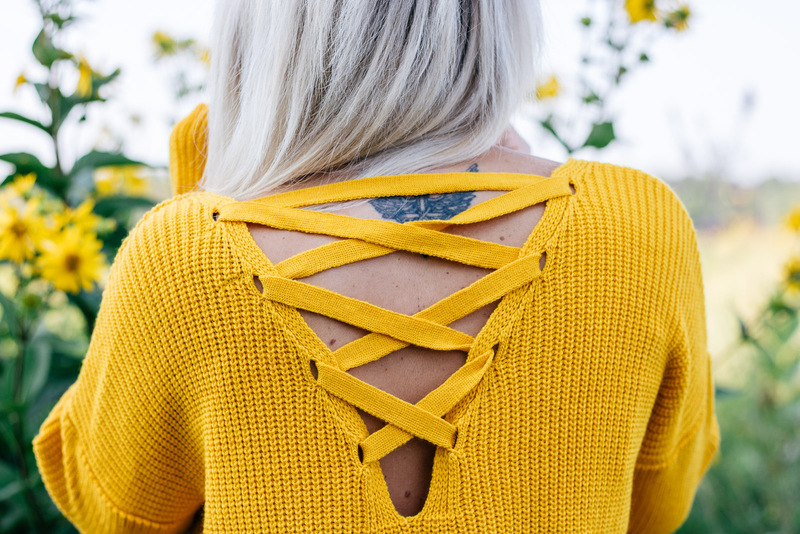 Bell sleeves, lace up on the back, mustard color, and super duper comfortable. I ordered a size 6 because it said it fit like a 2-4 but I probably could have gotten away with one size smaller. But I don’t mind the oversized look so I decided to just keep it. But size down if you want it more fitted. This week I decided to team up with some of my favorite bloggers and bring you an amazing giveaway. One lucky reader will win a $650 gift card to Amazon.